The yard is filled with young birds just out of the nest. The California towhees have dropped off the first youngster of the year and gone off to raise a second brood. When I go out to pull a few weeds in my neglected vegetable garden, I usually have a companion. The young towhee keeps me in sight as it prowls the undergrowth for insects and seeds. I’m not sure if I am company or a second pair of eyes to watch for the Cooper’s hawk. 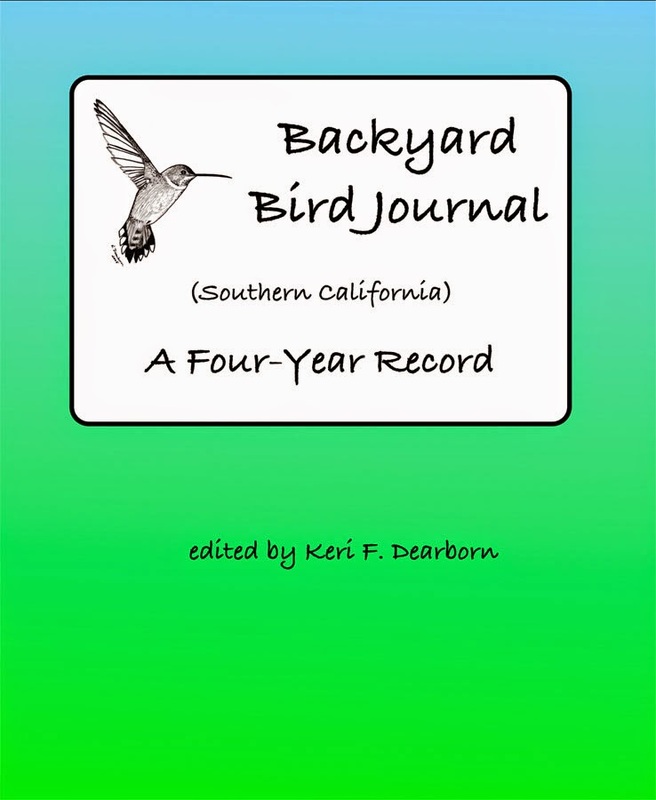 Unlike the towhees where both parents participate in feeding and raising the young, hummingbird females are all on their own. We don’t have many hummingbirds at our feeders, what we have is a nursery area–five or six Allen's hummingbird females nesting in specifically drawn territories. We seldom see males. The girls don’t want flashy breeding guys drawing attention to the location, so they typically chase them away. Occasionally a young male, usually hatched here, will be allowed to stay for a while. But as he reaches maturity, he is told in no uncertain terms that this area is off limits. Hummingbird mothers work hard to lay, incubate and then feed their young. 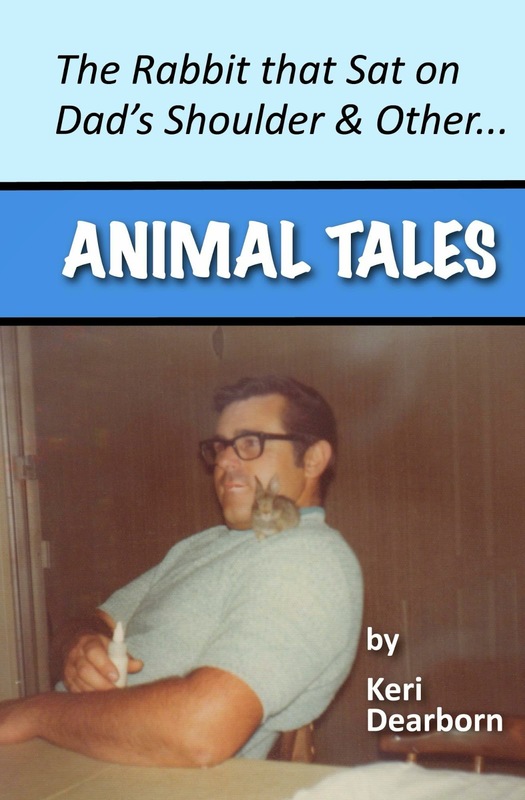 They don’t want a male attracting attention and risking the lives of vulnerable nestlings. Right now, the busiest kids in the yard are the four Allen’s hummingbirds that have fledged in the last two weeks. This year I have found four nesting females: A, C, D and F. A hatched here in the yard in 2005. When her mother disappeared, she seemed to inherit her mother’s territory. Last year she had trials as a mother, A’s nesting in 2007, this year she laid early and had her kids out of the nest before the jays came marauding. A’s first brood fledged on 4/1 and 4/2. 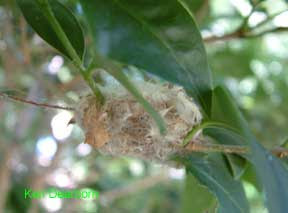 Typically, hummingbird eggs are laid a day or so apart and frequently the youngsters will be staggered in their maturity. 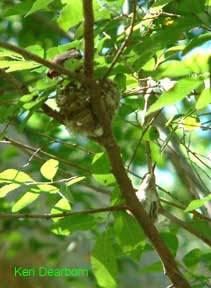 D made her first nest high in a grevillia tree, but it was destroyed in one of our winter storms. Her second nest was lower in a protected area and her two youngsters fledged on April 14, 2008. 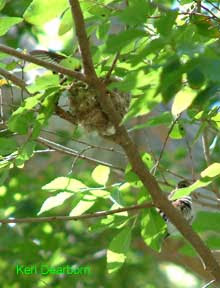 Here you can see one sitting on the edge of the nest and the slightly older one sitting about six inches from the nest. They both fluttered their wings furiously, exercising their flight muscles, buzzing a few inches at a time. In the second picture the younger fledgling has its wings spread wide as it tries to learn to fly. Mom kept returning all day to feed them and offer support. The older youngster flew off by midday and between 5 and 6 PM the younger one took flight as well. Yesterday, the two new kids were quite noticeable as D took them to visit the various feeders in the yard. There was quite a flutter when A’s youngsters realized there were two new hungry beaks at the feeder. Today the fledglings are pretty much on their own. 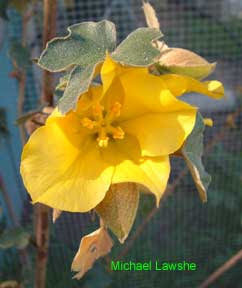 You can see them exploring different plants in the yard, trying to get the hang of what has nectar and what does not. Meanwhile, just two days after her job with one brood of youngsters is done, D is building a new nest to start the process all over again. She has moved to a small ficus bush and started the nest‘s button foundation. She will continue to build it up with plant and animal fibers, spider webbing and bits of different materials. What about C and F ? C’s youngsters should fledge in the next 4 to 5 days. And then there is F. I’m not sure what is going on in her nest. It’s a mystery. There were hatchlings, but they never seemed to get bigger. She’s still on the nest. Stay tuned, we’ll solve it. We had a soft, unmeasurable rain two nights ago. Follow that nocturnal dampness with two sunny days warming the ground and what do you get? Swarming subterranean termites, of course. I’d take a picture, but I can’t find the camera. You’ll have to believe me when I say these small, black termites with their two pairs of fluttering wings harken back to primordial times. Their flight is less flying and more rising up, clinging to the air and hoping for a breeze. They just need to get far enough away from home to drop to the ground, loose their wings and start their own wood devouring colony of their own. Does it surprise me to see swarming subterranean termites? No. Deep soaking winter rains encourage abundant flowers and the expansion of termite colonies. 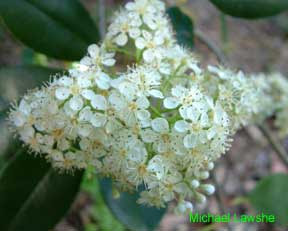 I’d love to show you a photo of the blooming photinia and flannel bush, but the camera is not to be found. (flannel bush at the top, photinia here, Michael found the camera) It is somewhere in the boxes of items that need to be moved back into the house after... you guessed it...TENTING FOR TERMITES! We had dry wood termites. They are bigger, more reddish brown in color when they take flight. Subterraneans? No, we didn’t have those. But somewhere up the hillside, these little guys are living underground naturally. Now, they are taking to the air, floating down the canyon right toward out house. Where are my western fence lizards when I need their hungry mouths? Where are the insect eating birds? Well at least the black phoebe has shown up and is snatching termites out of the air.